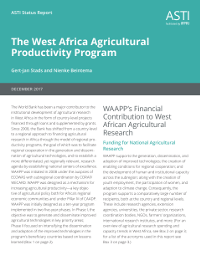 WAAPP has injected significant funding into West African NARSs since 2008 and made substantial progress in addressing the subregion’s most acute agricultural research challenges. The program has invested extensively in the construction and rehabilitation of research infrastructure and in the provision of laboratory equipment for predefined priority commodities. As such, it has strengthened the position of West African countries to perform high-quality, priority research over the coming years. WAAPP has also invested in postgraduate training for more than 1,000 young scientists across West Africa—30 percent of whom are female—which has significantly contributed to offsetting impending large-scale human capacity losses due to the retirement of senior researchers. Despite these important achievements, a few critical challenges remain. WAAPP funding has targeted priority commodities, so a number of important research priorities (including yams and cowpea) have been overlooked. It is therefore essential that research on orphan crops—which are also researched less extensively by CGIAR centers than rice, maize, and wheat, for example—not be ignored. In addition, more needs to be done to scale up the adoption of improved technologies to meet the food and nutritional needs of the population and to drive economic development and poverty reduction throughout West Africa. The proposed West Africa Agricultural Transformation Program is set to address these challenges by scaling up the adoption of climate-smart technologies to sustainably enhance productivity, reduce postharvest losses, increase value addition, improve nutrition, promote an enabling policy environment, strengthen the regional market, and generate youth employment. Another of WAAPP’s important accomplishments is laying the foundation for a truly subregional approach to agricultural research.